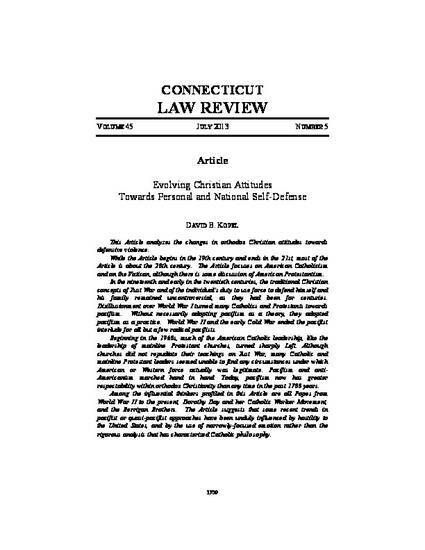 This Article analyzes the changes in orthodox Christian attitudes towards defensive violence. While the Article begins in the 19th century and ends in the 21st, most of the Article is about the 20th century. The Article focuses on American Catholicism and on the Vatican, although there is some discussion of American Protestantism. In the nineteenth and early in the twentieth centuries, the traditional Christian concepts of Just War and of the individual's duty to use force to defend himself and his family remained uncontroversial, as they had been for centuries. Disillusionment over World War I turned many Catholics and Protestants towards pacifism. Without necessarily adopting pacifism as a theory, they adopted pacifism as a practice. World War II and the early Cold War ended the pacifist interlude for all but a few radical pacifists. Among the influential thinkers profiled in this Article are all Popes from World War II to the present, Dorothy Day and her Catholic Worker Movement, and the Berrigan Brothers. The Article suggests that some recent trends in pacifist or quasi-pacifist approaches have been unduly influenced by hostility to the United States, and by the use of narrowly-focused emotion rather than the rigorous analysis that has characterized Catholic philosophy.